The first six innings of the matchup were a pitcher’s dual with Japan carrying a 1-0 lead. 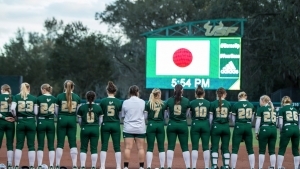 The Japanese National Team went ahead early with one run in the top of the second inning, but sophomore Georgina Corrick and senior Nicole Doyle held the team at one run through five innings with just five hits from the No. 2 team in the world. Japan’s perfect defense was tough for the Bulls who knocked off three hits and two runs in the international exhibition. Junior Brooke Hartman (Port Orange, Fla.) and freshman Meghan Sheehan (Forest Hill, Md.) each singled, but were left stranded.